Most people don’t realize that their digital camera takes picture at 4:3 aspect ratio, while the regular 4x6 photo print has a 3:2 aspect ratio. The aspect ratio of an image/photo is its width divided by its height. 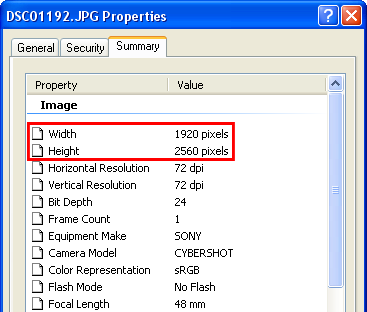 Take a look at the properties of one of your digital pictures find out the width and height in pixels for that image. In the above example, the image is in 2560 x 1920 resolution, which means 2560 / 1920 = 4 / 3. So the photo has a 4:3 aspect ratio. A regular 4x6 print is a photo with width 6 in and height 4 in, which means 6 / 4 = 3 / 2. So the print has a 3:2 aspect ratio. If you’ll gone print an image with 4:3 aspect ratio on a piece of paper with 3:2 aspect ratio, and you don’t want to distort the image, you’ll either end up cropping some regions out of the image or adding extra blank space on each side of the image. Most online photo printing services does the cropping job automatically for you. But since that’s an automated process they usually cut equal amount of data from both sides. In most cases this is fine, and goes unnoticed in the end product, but in some situations this automatic crop is not acceptable. Imagine cutting a person head when actually it’s better to cut from the other end of the picture. Cropping lots of pictures, one by one in a classic photo editor is a tedious job. JPEGCrops is a nice free tool that helps to lossless crop large number of photos in a visual and quick way. 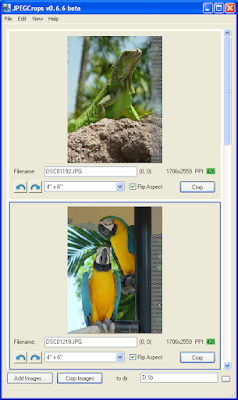 The tool does lossless cropping by manipulating the image data stream directly, rather than render it first and then recode it back to JPEG. Lossless cropping may seem insignificant at first, but if you’ll gone pass the same image through different processors then it actually makes very sense. After you finished cropping take a look at this post that shows you how to put date/time on each picture just before sending them to print.